Sausage Leczo / Lecso (Hungarian Vegetable Stew) – only 4 ingredients and a great use for your summer vegetables! Full of tomatoes, green peppers and onion! 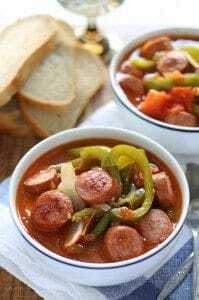 My dad’s dad (my grandpa) was from Hungary and we grew up eating a delicious Hungarian stew called lecso (lay-cho). When I did research on the history of this traditional vegetable stew, however, I found that other countries have their own version. And that version is often spelled leczo. This probably isn’t a big deal. It probably isn’t any kind of deal at all. I had several moments of wonder though, wondering if I had been spelling it wrong for 30 years. For that reason alone, I will reference both spellings in this post. Digging this recipe out of the family coffers was more difficult than I expected it to be. Several phone calls and emails to my dad, asking for the recipe, amounted to no response or a half response. I finally had to reach out to my uncle and my dad’s cousin. And that’s when I realized that my dad’s half response was actually the recipe. Lecso / leczo is so easy to make that for over a year I thought he was trying to keep the recipe from me. In reality, I just didn’t understand the recipe is very simple. Leczo/lecso is a vegetable stew that is part of traditional Hungarian and European cuisine. 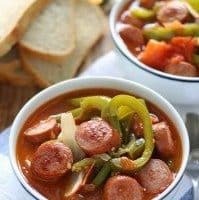 My family always adds sausage to it but if you are looking for a vegetarian soup and leave it out, you will still have a delicious soup. To make this stew, you put your vegetables in a big pot and let them cook down until the heat and steam creates a juicy broth right from the veggies. My dad kept telling me, “Jen, get some tomatoes and green peppers and the biggest onion you can find and put it all in a pot.” If you heard that, you would probably think something was missing too. After my other family members reiterated the simple recipe, I set out to find the best ratio of vegetables. Luckily it is August and harvest season. If you are lucky enough to have a vegetable garden or a nearby awesome farmer’s market, save some veggies to make this soup. 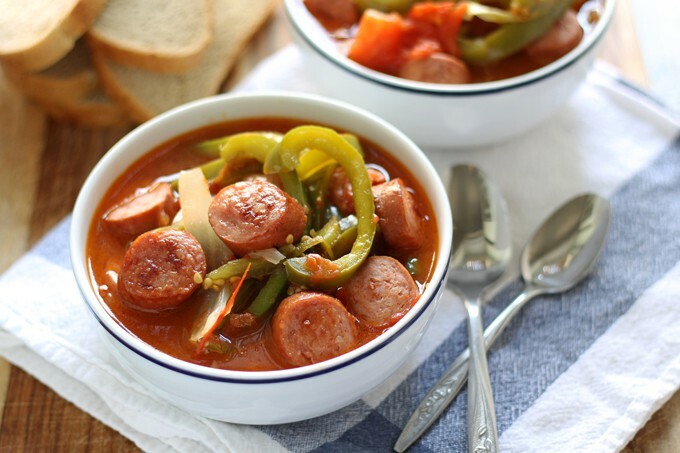 If not… buy some at the store and make this soup. Basically, just make this soup. You will be glad you did! Sausage Leczo / Lecso (Hungarian Vegetable Stew) - only 4 ingredients and a great use for your summer vegetables! Full of tomatoes, green peppers and onion! Put the tomatoes, green pepper and onion into a large soup pot. Set heat to medium and cover the pot. Stir occasionally. After 30 minutes, add the sausage. Cook for at least 30 more minutes. Soup is done when the vegetables are tender and a vegetable broth has developed. Optional: Fry sausage rounds before adding to soup pot. 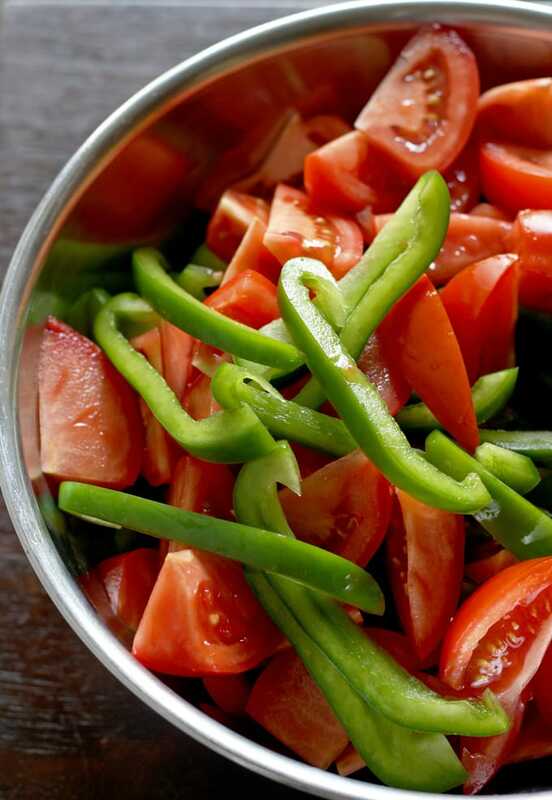 Looking for more recipes for summer vegetables? 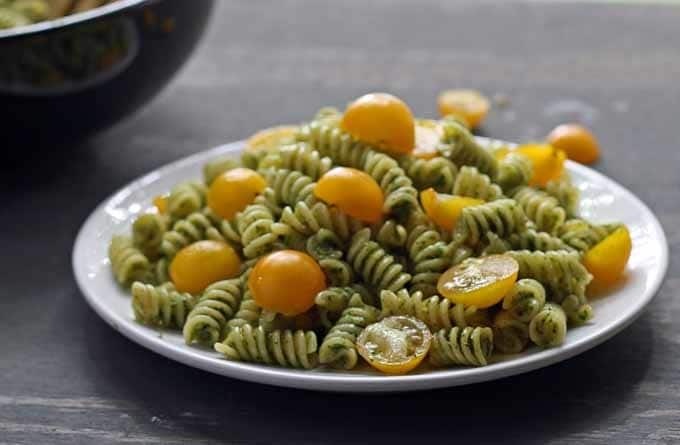 or this summer pesto pasta! Came by to share and had to comment. Looks great! Thanks Peter!! You’re near me in Chicago, next time I make a batch I will let you know! I think this recipe sounds delicious! Love how simple it is and makes it even better that it is a family recipe! I’m always looking for new, cultural recipes. I can’t wait to try this. It looks like the perfect soup for fall weather! Thank you Chrissa – can’t wait to hear how you like it! 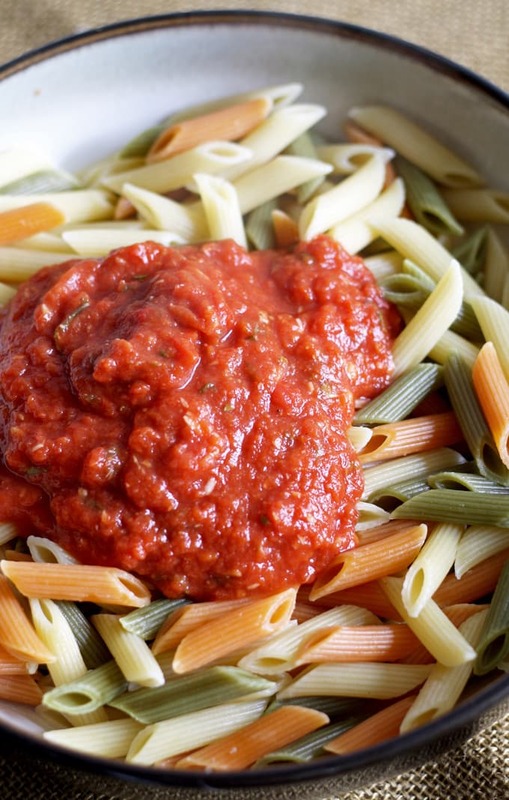 Yep, you don’t add any liquid at all – the vegetables simmer down and create their own liquid. This is #onthemenu for Fall, that’s for sure! 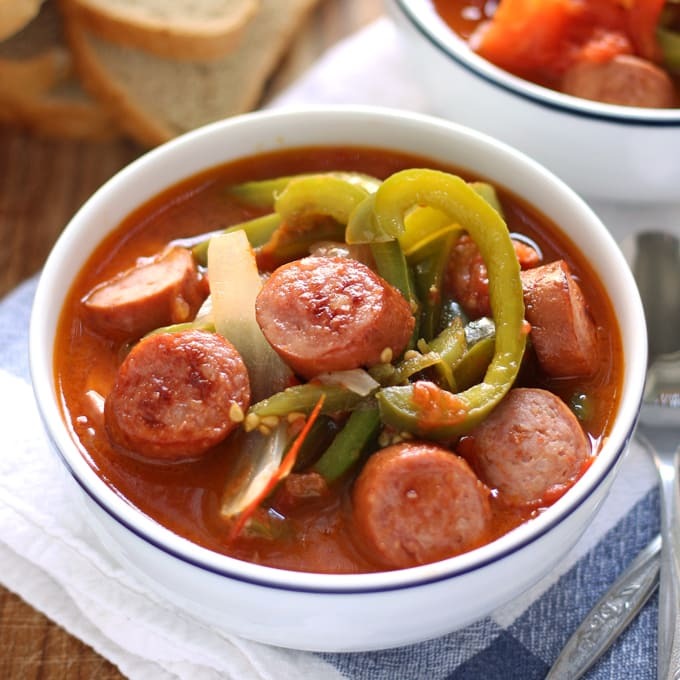 I love making soup with kielbasa. 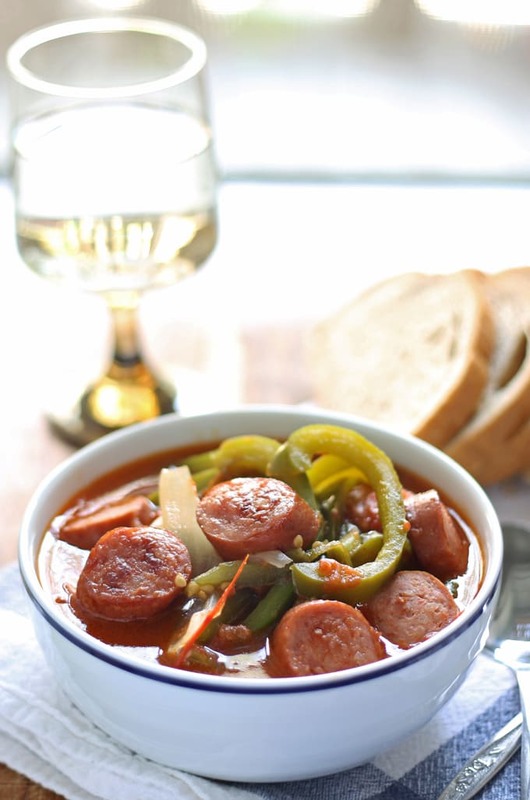 Heck, I love making ANYTHING with kielbasa. YUM! The broth actually comes from the vegetables themselves. Hopefully there are no tears involved. Thank you for you comment. My family did not make it with eggs though I have read that is sometimes done. There are versions from many different Eastern European countries and I bet many different regions in those countries as well. This is my family recipe and I consulted with multiple family members before writing this. Perhaps our families are from different areas. Either way, for anyone looking for more information on lecso, feel free to check out this article – https://en.wikipedia.org/wiki/Lecsó.